The RCA Badge above the door at Bessborough Armoury. Following the war, 15 Coast Regiment became a reserve unit. A link was maintained with Fort Grey until 1948, when the Regiment became 15 Field Artillery Regiment. The guns were soon removed and only a caretaker detachments remained until mid 1950. 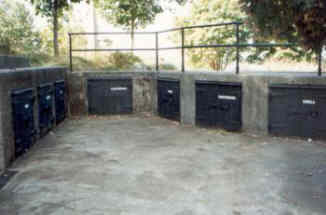 The Battery OP remained in army use as a transmitter station until the 1960s. Once the military had gone in the late 1940s, the barrack accommodation became home to students of the University of British Columbia. The name of the area was changed to Fort Camp, and the gun emplacements were abandoned and left to nature and the tender mercies of vandals by 1955. On 17th March 1968, Point Grey was transferred from the Department of Defence to the control of the Province, and 100 years of military control ended. Work on the Museum of Anthropology began in 1974, and much of the gun emplacements were destroyed in the construction. No. 2 emplacement was built over and No. 3 was mostly destroyed. Only a sorry No. 1 emplacement remained. Down on the beach, the searchlight towers still stood watch. There were some plans made to cover over No. 1 emplacement and disguise it as an oriental garden. Military historians can be grateful that this did not happen. To try and prevent this last link with the past disappearing, 15 Field Artillery Regiment is trying to restore the remains of Point Grey Battery. After all, the history of defence is just as important as that of Anthropology. In fact, without defence, would there have been a Museum of Anthropology? 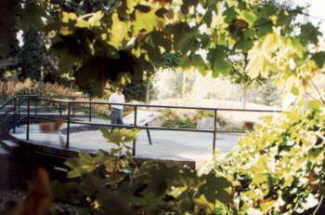 The Regiment has been fortunate in being financially assisted in its task by the British Columbia National Heritage Trust. 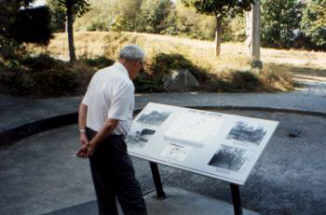 Left:The Gun Platform with a stand displaying information about the site. 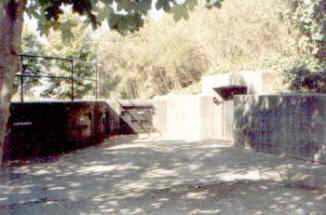 Right:The Gun Platform from just to the rear of the Ammunition Hoist. Left: The Stores and Shelter. A wall of the Museum of Anthropology can be seen top left. This graphically demonstrates how close the emplacement came to destruction. 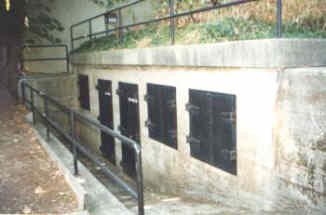 Right: Storage Lockers built in to the left of the Gun Platform. 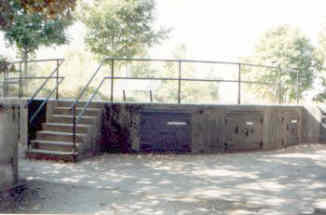 Left: Steps leading up to the Gun Platform, and Ammunition Lockers. Right:The Ammunition Hoist is to the right of the photograph.